"One day a woman went hoeing in the field. Before she started hoeing she put her baby under the shade of a tree. Whilst she was working in the field some baboons came and stole her baby." The constantly original and creative Charles Dhewa grabbed instantly our attention during a session at the 2011 IFAD ShareFair as he told one of the Bantu narratives he describes in his powerful paper, "Traducture and Sensemaking: Experiences from Southern Africa". We were working together in a session exploring sense-making as a process, and the stories were triggers for us to reflect on how different people take different meanings from a single prompt. 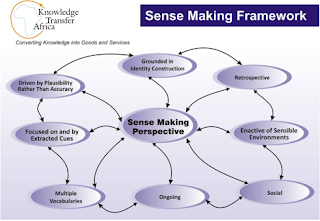 Dhewa developed the sense-making framework illustrated above that embraces the complexity of this process, especially when working with people from different cultures and with widely varied experience. The paper explores the dimensions illustrated above and it's a good introduction thinking about the role of a facilitator in working with large and small groups of people as they sense together and shape ideas and new meanings from their discussions. World Cafe, where participants have rounds of conversations on linked sets of questions, with 'hosts' at tables recording the progressively richer exchanges.